This ancestral Pueblo Kiva is located in Mesa Verde National Park, southwestern Colorado. 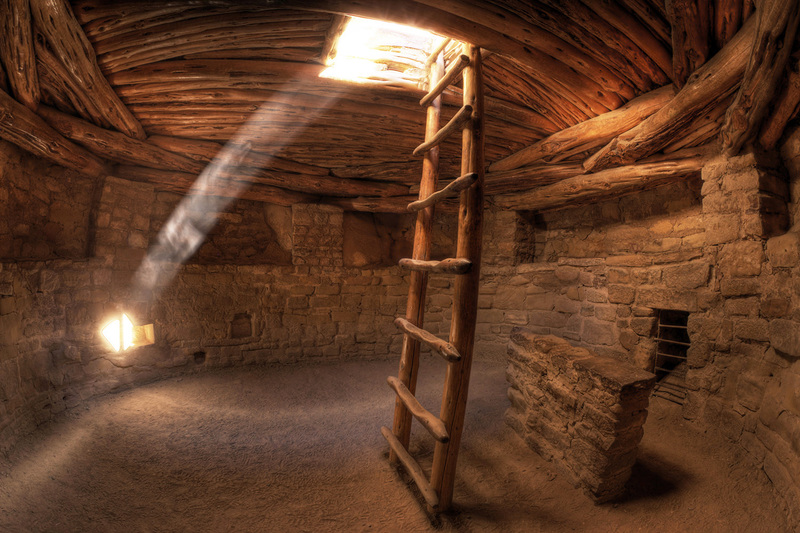 Traditionally a secluded place for ceremony and worship by the men of the Pueblo tribes, Kivas were built underground or in caves, and included a firepit, with a cleverly designed air shaft to draw in fresh air. This photograph captures more than beautiful warm color and the drama of light in a dark space. It also pulls the viewer inside, letting us experience the close walls, low ceiling and sense of tranquility. The exhibit, which will include the Indian Kiva photograph by Stephen Oachs, will showcase selected finalists from Smithsonian Magazine's 6th Annual Photo Contest. San Jose CA-May 20, 2009-The photograph, "Ancestral Dimension", conveys more than beautiful warm color and the drama of a striking shaft of light in the darkly confined underground space of an ancient Pueblo Indian Kiva. The evocative image, captured by acclaimed Fine Art Photographer, Stephen W, Oachs, pulls the viewer inside to experience the close, rough sandstone walls, the low and encroaching ceiling, and an almost haunting sense of tranquility. "As a photographer, I am privileged to see many amazing places. With every scene I capture, my goal is to stir a similar emotion in the viewer to what I felt being there--just as this Anasazi Indian ruin captured my imagination during my visit," said Oachs. "I'm excited, and fortunate, that my work will be seen by millions of visitors to the Smithsonian Castle. I am honored with this rare opportunity to have my photograph as a part of the World View Exhibit." The upcoming World View exhibit showcases 30 of the 50 finalists selected from over 17,000 international entries in Smithsonian Magazine's 6th Annual Photo Contest. The exhibit, which will include the Indian Kiva photograph by Stephen Oachs, will be on view from July 1, 2009 through January 17, 2010 at the Smithsonian Castle at the famed National Mall in Washington DC. Stephen W. Oachs is an award-winning photographer, successful entrepreneur and technology veteran. Completely self-taught, Stephen's unique and distinctive style is earning him recognition as one of today's finest digital nature photographers. He has received numerous awards and achievements, including being named wildlife photographer of the year in 2007 by the National Wildlife Federation, and best nature photographer in 2008 by National Geographic Magazine for his work photographing the endangered snow leopard. His work has graced the pages of such notable on and offline worldwide publications such as National Geographic, Popular Photography, Outdoor Photographer, National Wildlife Magazine, Smithsonian Magazine and many others. Stephen's photography is sold online and through art exhibits and galleries in the northern California/Bay area. He is available for presentations and speaking engagements, and conducts public and private on-location photography workshops. To contact him or learn more about his workshops, visit his Website and online gallery at www.stephenoachs.com .